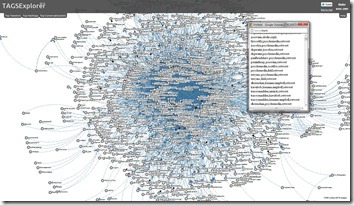 It’s the last day of the OER Visualisation Project and this is my penultimate ‘official’ post. Having spent 40 days unlocking some of the data around the OER Programme there are more things I’d like to do with the data, some loose ends in terms of how-to’s I still want to document and some ideas I want to revisit. 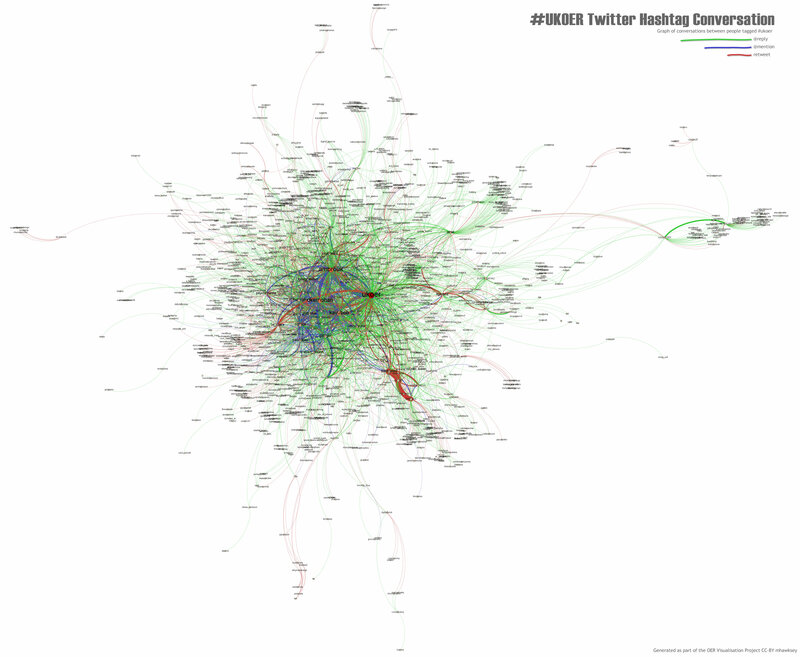 In the meantime here are some of the outputs from my last task, looking at the #ukoer hashtag community. This follows on from day 37 when I looked at ‘the heart of #ukoer’, this time looking at some of the data pumping through the veins of UKOER. It’s worth noting that the information I’m going to present is a snapshot of OER activity, only looking at a partial archive of information tweeted using the #ukoer hashtag from April 2009 to the beginning of January 2012, but hopefully gives you an sense of what is going on. I revisited the heart after I read Tony Hirst’s What is the Potential Audience Size for a Hashtag Community?. In the original heart nodes were sized using ‘betweenness centrality’ which is a social network metric to identify nodes which are community bridges, nodes which provide a pathway to other parts of the community. When calculating betweenness centrality on a friendship network it takes no account of how much that person may have contributed. 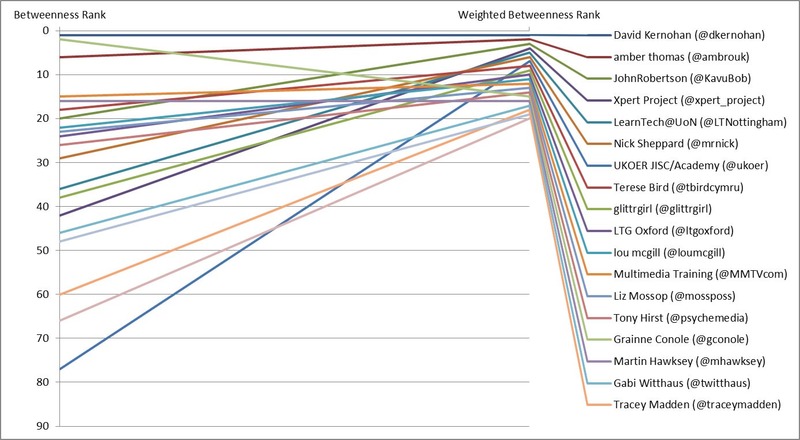 So for example someone like John Robertson (@KavuBob) was originally ranked has having the 20th highest betweenness centrality in the #ukoer hashtag community, while JISC Digital Media (@jiscdigital) is ranked 3rd. But if you look at how many tweets John has contributed (n.438) compared to JISC Digital Media (n.2) isn’t John’s potential ‘bridging’ ability higher? There may be some research in this area, and I have to admit I haven’t had the chance to look, but for now I decided to weight betweenness centrality based on the volume of the archive the user has contributed. So John goes from ranked 20th to 3rd and JISC Digital Media goes from 3rd to 55th. Here’s a graph on the winners and losers (click on the image to enlarge). 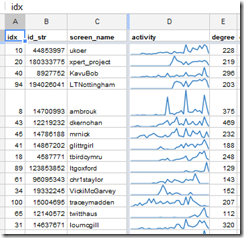 In previous work I’ve explored visualising Twitter conversations using my TAGSExplorer. 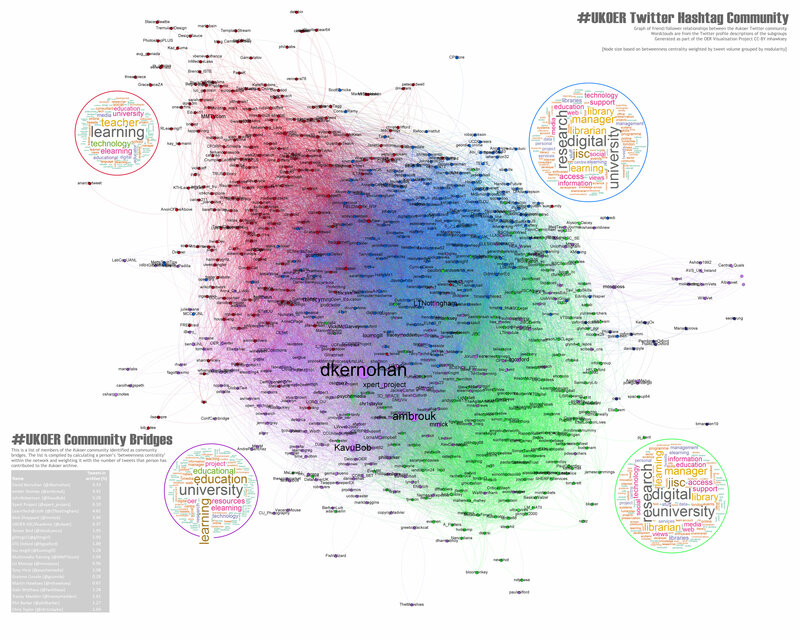 Because of the way I reconstructed the #ukoer twitter archive (a story for another day) it’s compatible with this tool so you can see and explorer the #ukoer archive of the 8300 tweets I’ve saved here. One of the problems I’m finding with this tool is it takes a while to get the data from the Google Spreadsheet for big archives. Processing the data in Gephi you get a similar ball of awesome stuff (ukoer conversation on zoom.it | ukoer conversation .jpg). What does it all mean I hear you ask. These flat images don’t tell you a huge amount. Being able to explore what was said is very powerful (hence coming up with TAGSExplorer). You can however see a lot of mentions (coloured blue and line width indicating volume) in the centre between a small number of people. It’s also interesting to contrast OLNet top right and 3d_space mid left. OLNet has a number of green lines radiating out indicating @replies indicating they are in conversations with individuals using the #ukoer tag. This compares to 3d_space which has red lines indicating retweets suggesting they are more engaged in broadcast. Is there still a pulse? When looking at the ‘ball of awesome stuff’ it’s important to remember that this is a depiction of over 8,000 tweets from April 2009 to January 2012. How do we know if this tag is alive and kicking or not just burned out like a dwarf star? The good news is there is still a pulse within #ukoer, or more accurately lots of individual pulses. The screenshot to the right is an extract from this Google Spreadsheet of #UKOER. 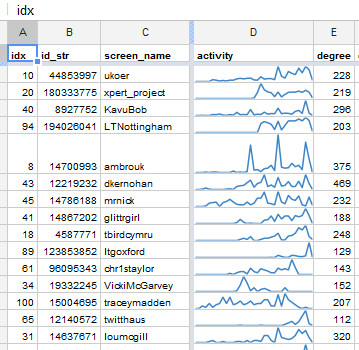 As well as including 8,300 tweets from #ukoer it also lists the twitter accounts that have used this tag. On this sheet are sparklines indicating the number of tweets in the archive they’ve made and when. At the top of the list you can see some strong pulses from UKOER, xpert_project and KavuBob. You can also see others just beginning or ending their ukoer journey. The good news is the #ukoer hashtag community is going strong December 2011 having the most tweets in one month and the number of unique Twitter accounts using the tag has probably by now tipped over the 1,000 mark. One question though…when you re-calibrated the betweenness centrality of individual tweeters every rating changed except David K’s. Any idea how to account for that? 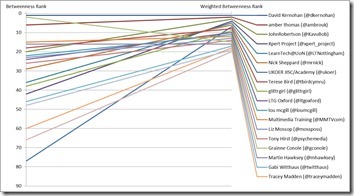 Hi Lorna – yes a lot to take in ;) David remained top because not only did he have the top original betweenness centrality but he was also the top contributor. just found your really helpful way of exporting the relevant visualization data. 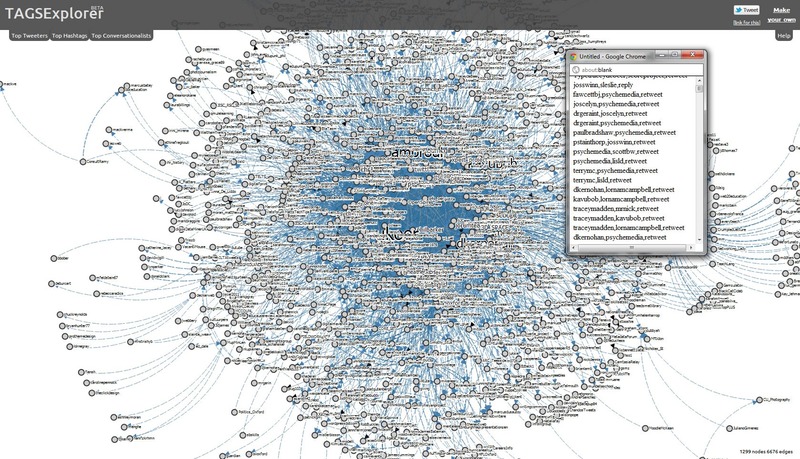 Sooo: I’ve got the raw data (Source,Target,Tweet Type) as plain text but don’t know how to import it in Gephi. If I create a .csv file in Sublime and open it in Gephi I have a network, but unfortunately it also includes the main actors Retweet and Answer. This is, of course, something, I’d like to get rid of. My question is how I properly import the plain text to Gephi in a manner that it actually shows the “real” network? Am I on the right track or should I import the plain text in a different application or is there something else I’m not seeing at all? Thanks for your very very cool and helpful tools!